The Liam Neeson action/thriller genre began 10 years ago with “Taken”. Over the past decade, he’s starred in a dozen or so movies in which his character seeks revenge over something that has really ticked him off. 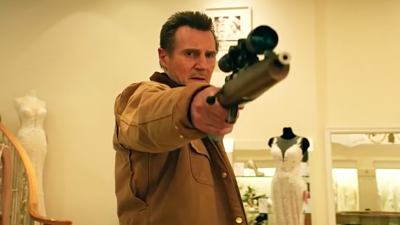 In promoting “Cold Pursuit”, the latest entry in this unique franchise (that follows the exact same plot – just in a different setting), Neeson voluntarily shared that 40 years ago he actually sought revenge and was ready to kill someone. This admission has (no surprise) caused a controversy, with many moviegoers now questioning whether revenge films starring Neeson should continue. Well, after seeing “Cold Pursuit”, it’s crystal clear that it’s finally time for the actor to step away from this storyline. “Cold Pursuit” is directed by Hans Petter Moland and is based on his 2014 Norwegian film “In Order of Disappearance”. Neeson plays Nels Coxman, a snow plow truck driver in the fictional ski resort town of Kehoe, Colorado. Coxman is named Kehoe Citizen of the Year the same night his son, an airport baggage worker, is… “taken”, drugged and killed. When Coxman learns what happened, he begins looking for those responsible. “Cold Pursuit” attempts to be “Pulp Fiction” meets “Fargo”. Frank Baldwin’s feature film debut screenplay is overly cute and clever, mixing broad humor with intentionally shocking ultra-violence. The results are just as painful for the characters involved as they are for the audience. The script is packed with far-fetched, unbelievable elements. Those tempted to characterize this movie as a dark “comedy” or guilty pleasure display an embarrassing lack of taste. There’s scene in which we get to watch a small dog defecate. There’s the obligatory severed human head in a box. And jokes include a group of Native Americans attempting to check into a hotel without a “reservation”. This screenplay will be a solid contender for ‘worst of the year’ honors. The surprisingly thin plotline is stretched-out to two hours as characters get introduced… and quickly killed-off. The repetitive pattern becomes old very quickly. Tom Bateman gives one of the weakest on-screen performances in any film in years as “Viking”, a drug kingpin and Coxman’s ultimate target. It even seems as if his dialogue was re-dubbed in post production – just one on many technical blunders on display. John Doman and Emmy Rossum play the predictably clueless local police officers – always two steps behind. And with an obvious lack of enthusiasm, Neeson simply goes through the motions. It’s impossible not to get the feeling that he’s pretty much done with this genre as well. Had he been given the chance to do a parody of his “revenge dad” role here it may have worked. But he isn’t and it doesn’t. The best performance in “Cold Pursuit” is delivered by Laura Dern, who plays Neeson’s wife. Not for her acting, but the fact that she’s only appears in a handful of early scenes and completely disappears after about 20 minutes. A fantastic decision. I was tempted to join her. On The Official LCJ Report Card, “Cold Pursuit” gets a D-.